You can wade through as many press quotes about “Texas-sized” as you want or see how many top-whatever lists Wo Fat have made since the Dallas trio got started in 2003, but none of that is going to be the same as staring down their swampadelic fuzz groove for yourself. If you want to know the monster, shake its hand. In 2014, Wo Fat will release The Conjuring, their fifth full-length and second through Small Stone. Like their last two, 2012’s The Black Code and 2011’s Noche del Chupacabra, it’s a heavy-riff/heavy-jam blast of a time – the kind of record that turns the vaguely interested into converts and that makes the corners on squares look even sharper. Guitarist/vocalist Kent Stump, bassist Tim Wilson and drummer/backing vocalist Michael Walter are jazz-combo tight and their roll is easy and natural, like you remember Fu Manchu being, but bigger-sounding and in the case of The Conjuriing, darker as well. There’s been a creature lurking in the woods since Wo Fat’s 2006 debut, The Gathering Dark – their second album, 2009’s Psychedelonaut, pulled back on the threat some to lighten the mood – but whether it’s the motor-driven rush of “Read the Omens” or the you’re-already-lost-in-it riff-exploration of 17-minute closer “Dreamwalker,” The Conjuring is indeed a backwoods ritual. Bluesmen have sold their souls for less. Veterans of Roadburn, Desertfest and a prime slot at Freak Valley 2014, and self-sufficient with Stump handling the recording at his own Crystal Clear Sound in Dallas, Wo Fat push their jams farther than they’ve ever gone before on these five tracks. Topped off with a mastering job from Nolan Brett at Stump’s studio and an otherworldly cover courtesy of Alexander Von Wieding, the beast that Wo Fat’s tectonic riffage calls to earth has never seemed more real or more alive than it does on The Conjuring. Does this band really need an introduction? I hope not as Wo Fat are currently one of the finest bands in the Stoner Metal world currently today. The band has been going for 10 years and has released 5 critically acclaimed albums. Wo Fat have a fearsome live reputation that has seen these guys labelled as a must-see act. This hard-rocking Psychedelic Stoner Metal power-trio never seems to be out of the game long enough to impress people with their music. 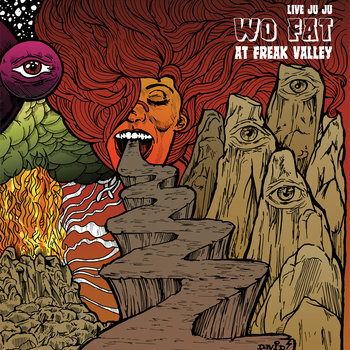 And today is no exception as Wo Fat are about to release their incredible new Live album – Live JuJu: Wo Fat Live at Freak Valley. The album was recorded during their Freak Valley Festival Appearance back in June 2014 when Wo Fat were on their second European Tour called The Texas Takeover Tour with their good friends – Mothership. I was lucky enough to catch this tour when they made a one stop visit to London Underworld in May 2014. Now, Wo Fat have decided to release a live album showing what went down at Freak Valley and the results are now here for everyone to witness. So are you ready to join Kent, Michael and Tim performing to an excited crowd. The album opens with a German voice announcing Wo Fat to the stage and they open with a real classic – The Black Code – from their 2012 landmark album. The album sounds great right from the start as Wo Fat slowly start playing those familiar magical psychedelic riffs or swampedelic riffs as the band call their music. Kent’s vocals take a few moments to become focused after a low-key start but from then on in its all systems go. If you’re a long time Wo Fat fan you’re going to be rocking out like there’s no tomorrow as Wo Fat are on fire through out. Second Track – Read The Omens – is from their 2014 album – The Conjuring – and it sounds heavier when played live. The album makes you feel you were at the festival yourself seeing Wo Fat perform live. It’s another heavy thunderous offering that only Wo Fat can deliver. There doesn’t seem to be much audience interference when Wo Fat play between songs as it’s fairly quiet from them. Then again, Wo Fat doesn’t give the audience the chance to catch their breath especially when moving onto the third song from the set – Bayou Juju. Another Wo-Fat hard rocking number that will have old-school fans foaming at the mouth. Kent’s vocals are slightly lost amongst the high amounts of FUZZ but not for long as Wo Fat are once again in confident mood showing the world why the band are highly thought of. The other two live tracks – Enter The Riffian and Sleep Of The Black Lotus – bring more Swampedelic magic to fully experience as Wo Fat are just having way too much fun playing extended jams and riffs for you to experience. Now we finally start to hear the audience finally enjoying Wo Fat’s performance. I always think the magic of a live album is hearing the audience’s reaction. It makes for a better experience. By the end of the live performance, Wo Fat has played their hearts out to a truly appreciative audience as they leave to a rapturous reception. Now it’s time for the bonus track – Dark Snow (Bonus Live Studio Jam” – A 14 minute plus unreleased track opens up with a hazy psychedelic riff with hints of loud reverberation and fuzz to awaken your senses to. When the guitars finally come into action there’s a nice sideline of Jimi Hendrix style psychedelic rock. It’s a purely instrumental affair that’s being released as a digital download only. Sorry to disappoint all you Vinyl fans. It sounds like this song is from The Black Code or The Conjuring sessions as it has that familiar vibe from those two classic albums. If you’re already a fan of Wo Fat then Live JuJu: Wo Fat Live at Freak Valley is a must have album to add to your Wo Fat collection. If you’re a first time visitor to the world of Wo Fat then this is the best place to start. The album sounds incredible from start to finish, it really does. Did we expect anything less? We all know how great Wo Fat records sound. Well this is no different. This is a must have live album. Thanks to Wo Fat for the promo. Live JuJu: Wo Fat Live at Freak Valley will be available to buy from March 17th 2015 on DD/Vinyl.